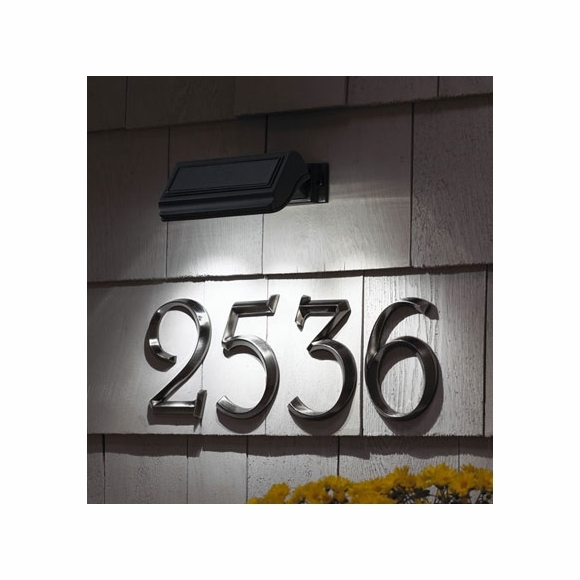 Solar Address Lamp - - illuminates outdoor house numbers, address plaque, or entryway. Standard solar lamp mounts on wall above address numbers, address sign, plaques, door. Includes all hardware for masonry, wood, or siding attachment. Or add an extender to illuminate a lawn-mounted address plaque. Shines brightly for up to 14 hours. Note: Integrated solar panel needs access to plenty of sunshine for charging. Automatically turns on at dusk and off at dawn. Super bright LED lights stays uniformly lit over time. Provides a full night of illumination. Lamp dimensions: 6.75"W X 2"D X 6.875"H.
Solar Address Lamp illuminates outdoor address numbers at night. Some clients refer to this item as our solar address light. We're very happy with this light. It's not a white light like shown in the ad photo, but more blue and still lights our slate address numbers brightly. I installed this just prior to winter so there are minimum hours of sunlight to charge the batteries but it still illuminates all night long. The light is easy to install on wood siding.